This is to inform the public that JAMB has enabled the portal for the 2017 Direct Entry registration. 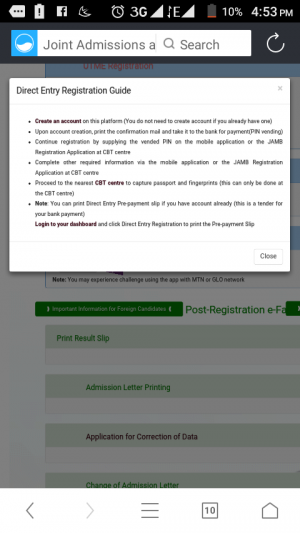 -Continue registration by supplying the vended PIN on the mobile application or the JAMB Registration Application at an accredited CBT centre. Check here for the list of CBT accredited centres. However be sure you do not visit any of the blacklisted CBT centres. -Complete other required information via the mobile application or the JAMB Registration Application at an accredited CBT centre. Note: The cost for the Direct Entry form is five thousand Naira (N5000). However you will have to pay additional Five Hundred Naira (N500) for the book "Last Days at Forcadoes High School." 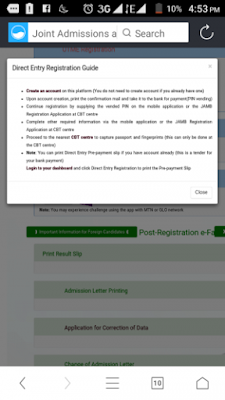 0 Response to "JAMB Enables Portal For 2017 Direct Entry Registration - See Official Guide"